ALPENA, MICH — Alpena senior Chris DeRocher had a chance to shoot for history Tuesday night against the Sault Ste. Marie Blue Devils. Students, family and fans packed the gymnasium, hoping to witness the historic event, and DeRocher only needed 29 points to top a record that has stood 47 years. Raymond “Butch” Feher scored 1,435 points as a Wildcat from (1969-72). Basketball talent runs in the DeRocher family. Chris’ Aunt Cindy, who now sits third in Alcona High School record books, scored 1,263 points which broke the Tigers’ record in 1979. Now it was DeRocher’s turn to break the Alpena record. The senior needed to shake the jitters off before scoring his first bucket with 3:06 left in the first quarter. Once DeRocher got momentum, he kept rolling scoring 10 first quarter points. A few key passes from teammates and outside three-pointers gave DeRocher 21 points at halftime, only eight away from breaking the record. The Wildcats held a 39-16 lead. The six-foot-six Wildcat came close to clinching history in the third, but two missed threes made everyone anxiously wait till the fourth quarter. Then with 6:49 left to play the moment happened. Sault Ste. Marie’s Michael Goldenbogen fouled DeRocher on the layup and he was sent to the charity strike. He made the first free throw, and that’s all he needed to become Alpena’s all-time scoring leader with 1,436 points. DeRocher ended the game with 29 points. 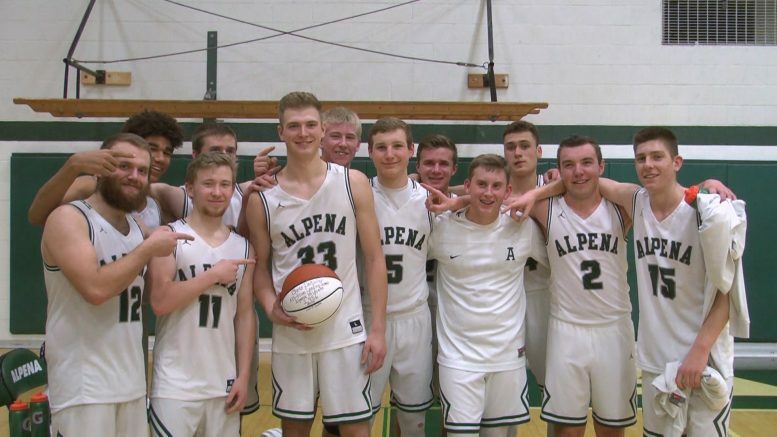 Alpena High School honored DeRocher with a basketball with his name and record written in ink, and the senior headed straight toward the stands to hand the ball off to his grandpa Oliver DeRocher. The Wildcats went on to defeat the Blue Devils 74-45 improving to a (10-2) overall record.